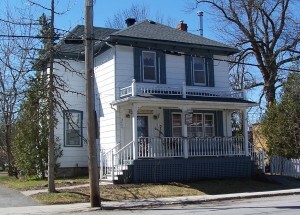 This house, representative of a late nineteenth century village home and commercial building was built at the time when the centre of the village moved north to the intersection of Perth and McBean Streets. The property is interesting for its owners, before and after, the house was built. The structure has housed a shoemaker’s shop, a tailor shop, and the village post office. For almost the last 20 years, it has been the site of “The Country Quilter”. Records indicate that John Bower Lewis purchased this property from Francis LaCharity in 1834. Mr. Lewis, a son of Captain John Lewis, was a prominent Bytown lawyer, mayor of Bytown (1848), first mayor of the newly incorporated City of Ottawa (1855-1857), and M.P. (1872). In his legal practice, J. B. Lewis represented many mortgage holders and owned much land including a farm in Nepean which became part of the Experimental Farm. After Mr. Lewis’s death, his wife, Elizabeth Susan Lewis, continued to own the property. In 1876, she sold it to Mr. Lewis’s sister, Henrietta Lauder. Although married to the Rev. John Lauder rector of Christ Church, Bytown, Mrs. Lauder still owned many other Richmond properties including the Lyon Store. In 1884, the land was sold to Henry McElroy. When this building was constructed is unknown but possibly some time after 1898 when the property was sold to Annie Boyle. It has had various uses over the last 110 years. Prior to 1902, it was used as a shoemaker’s shop. 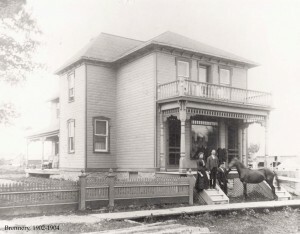 In 1902, it was the home of Alex Brennery, a tailor, and his wife, Isabella. From 1912-1941 John Hemphill operated the post office from his house. Mr. Hemphill was an active and respected village leader. He was Secretary of both the Carleton County Agricultural Society and the Richmond Hydro Commission (1928 to 1940) and was the village clerk for 20 years. For some of this time, Mr. Hemphill’s daughter, son-in-law, George Stewart, and their family lived here also. Mr. Stewart, an undertaker, used a building at the southwest side of the house for embalming. The house was used as a private residence for many decades but since 1993, it has housed “The Country Quilter” a fabric and quilting supplies shop. This fine two storey frame house with its ornate decorations and porches is an example of a village commercial building which contained both a residence and store. The 1902 picture above shows two entrances. The one on left was to the residence (there are stairs inside the door) and the one on the right was to the shop (note merchandise in window). To-day the right hand door has been removed and the decorative trim is gone but the basic structure remains. A board sidewalk ran from Perth St. to Ottawa St.
Cathcart, Percy et al. Goulbourn Memories. Ottawa: Goulbourn Township Historical Society,1996. Goulbourn Township Historical Society. files in Richmond Branch OPL. Interview, Robert Brown, May, 2009. Mullington, Dave. Chain of Office: Biographical Sketches of the Early Mayors of Ottawa (1847-1948). Renfrew: General Store Publishing House, 2005. This entry was posted in Locations and tagged commercial, House, post office. Bookmark the permalink.